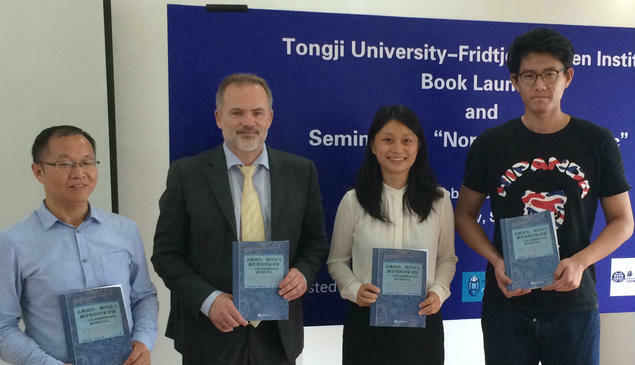 Both books are written by FNI’s Director, Geir Hønneland, who attended the book launch at Tongji University in Shanghai earlier this week. The first book started its journey in Norwegian language in 2013, under the title ‘Hvordan skal Putin ta Barentshavet tilbake?’ (‘How will Putin take the Barents Sea back? '), as a response to Russian criticism of the 2010 Barents Sea delimitation agreement between Norway and Russia. “I wrote the book to put the Russian reactions to the delimitation agreement in a cultural context,” says Hønneland, “but I never expected it to attract much interest outside our own backyard, so to speak. But it was picked up by the global academic publisher Palgrave Macmillan and was published in a revised edition for an international readership in 2014 under the title ‘Arctic Politics, the Law of the Sea and Russian Identity’. When Chinese scholars wrote to me and asked if it could be translated into Chinese, I first thought the subject matter would be too narrow, but then, as they say, Norway and China have one thing in common – Russia is neighbour to us both. The second book, ‘Making Fishery Agreements Work’, looks at half a century of Norway and Russia working successfully together to maintain the rich fish resources in the Barents Sea at a sustainable level. The Chinese edition was selected for inclusion in China’s 13th 5-year plan in the section on academic publications on ocean governance.